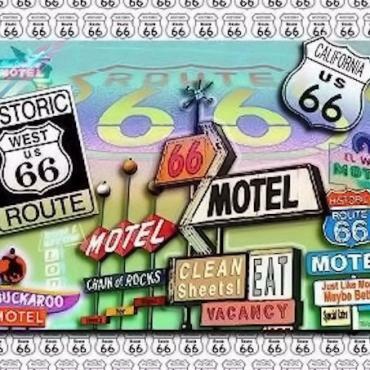 Get Your Kitsch On Route 66! 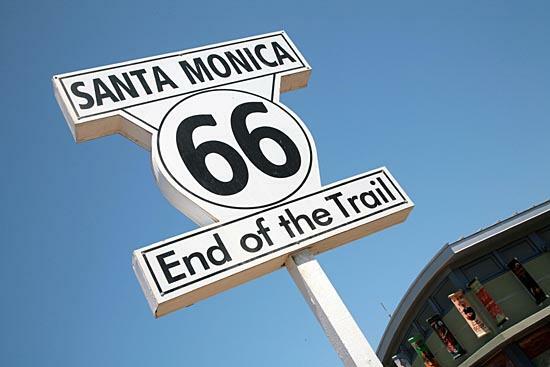 Originally commissioned in 1926, Route 66 stretches its concrete arms across three times zones and eight states as it covers 2,448 miles from Chicago to Los Angeles. It is crammed with nostalgia, kitsch and tradition at every turn and this is THE holiday itinerary for those wanting to experience the real deal. We'll be honest, this itinerary isn't full of luxury or fancy hotels, what it is full of is authentic Main Street, apple pie America. You'll go back in time and capture a moment that is all but lost today. The history, the stories, the people - it's all there for you to discover, dissect and delight. Welcome to the start of Route 66. The road originally began at the corner of Jackson and Michigan Boulevards in 1926, although parts of the highway have been in existence since 1857. Later the Lone Star Route connected Chicago and St. Louis and the National Old Trail Roads traced a path between St Louis and Los Angeles. Ultimately all these roads were connected to become Route 66. Before heading off on your Route 66 road trip, plan to spend some time in Chicago - birthplace of the skyscraper. Enjoy the views as you sip a 'sidecar' martini in the Signature Lounge on the 95th floor of the John Hancock Tower. 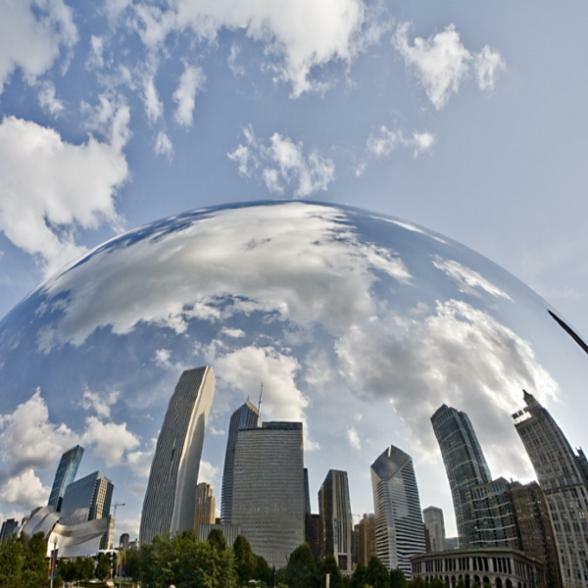 Mooch the neighborhoods of Chicago, shop the Magnificent Mile, take a cruise along the river, a stroll around Lake Michigan or delve into the city's seedy past on a 'Mob & Gangsters' tour. Treat yourself to a hearty breakfast this morning in Lou Mitchell's Restaurant, a Chicago landmark and a Route 66 favourite since the 1920s. 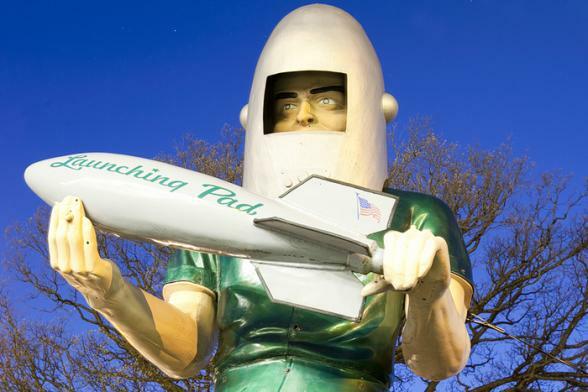 As you journey through Illinois the first icons of Route 66 will spring up from the roadside including the Gemini Giant, Odell's Station and you MUST stop at the Cozy Dog Drive-In for the quintessential hot dog on a stick. Today you'll cruise into Missouri by way of the historic Martin Luther King Memorial Bridge. First stop is St Louis' Gateway Arch with spectacular views of the mighty Mississippi River. You have your pick of interesting diners too, like Sweetie Pies owned by one of Tina Turner's Ikettes. Blueberry Hill, filled with pop culture memorabilia, is another popular spot too. Leave St Louis and cruise past Meramec Caverns and the city of Cuba - known as 'Mural City'. The 12 large murals here depict the history of the town from the mid-1850s. When you arrive in Lebanon head for the town library which is home to a terrific Route 66 Museum, or pop into Wrink's Market for some Route 66 souvenirs. In the evening check out the award winning southern deep fried catfish at Dowd's Catfish & BBQ stop. Grab breakfast in Faye's Diner then stop to see the birthplace of Dr Edwin Hubble, astronomer and Hubble Space Telescope namesake, in Marshfield before arriving in picture perfect Carthage. The center of Carthage is dominated by the outrageously ornate, circa-1895, Jasper County Courthouse, which you may recognise from the Back to the Future movies. Be sure to swing round Iggy's Diner for a root beer float. Cross the state line into Oklahoma and stop at Claremore, home of Will Rogers and the renowned J.M.Davis Gun Museum. 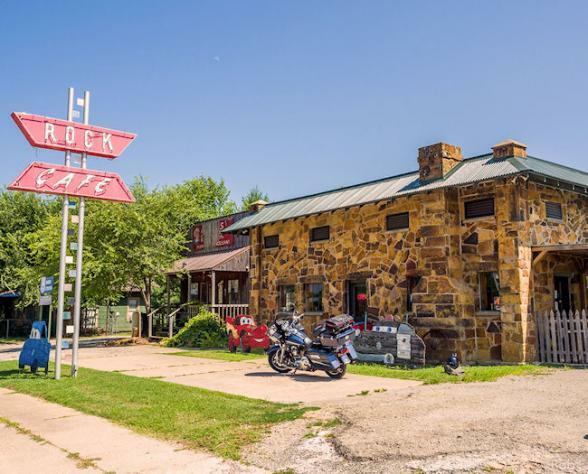 You'll also want to visit the Rock Cafe in Stroud, a Route 66 landmark built of native stone. 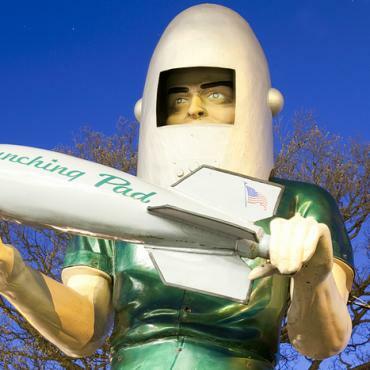 Before you pull into Oklahoma for your overnight, you'll cruise past Arcadia's historic 'Round Barn' built in 1898 and the famous 'Milk Bottle' building on Classen Boulevard. 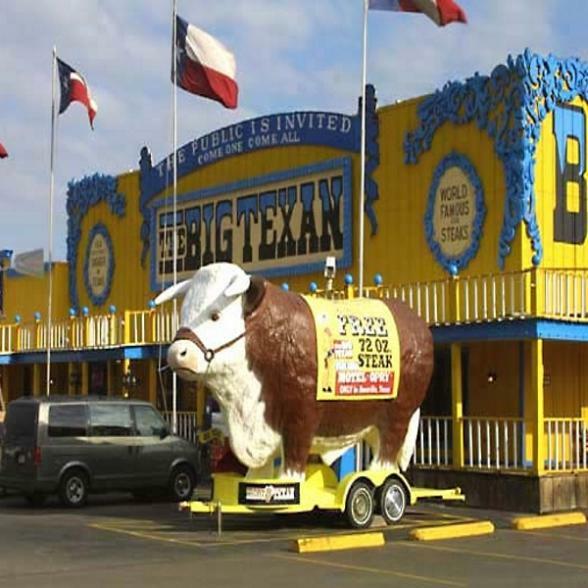 In the evening head to historic Bricktown for lively entertainment and mouth-watering BBQ restaurants. 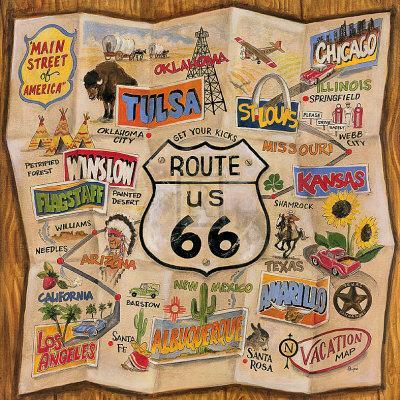 Oklahoma boasts the longest stretch of Route 66 and the National Route 66 Museum at Elk City celebrates Route 66 not only in Oklahoma but all eight states. Then it's on to Texas. 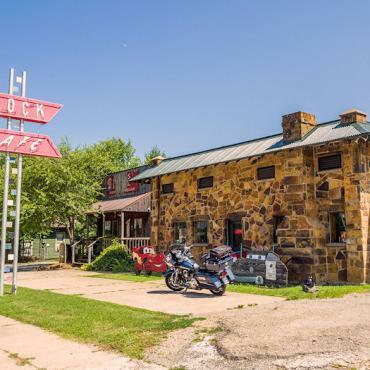 Be sure to stop in Mclean, one of the best-preserved, most obscure ghost towns along Route 66. The town's land was donated by a rancher from England in 1901. The rancher was Alfred Rowe and just 12 years after donating the land he was aboard the Titanic when it sank. According to reports, Rowe swam to a piece of ice, where he was found frozen to death - his watch still ticking. W.J Lewis bought Rowe's ranch from his widower and it's still around today as the Lewis Ranch. 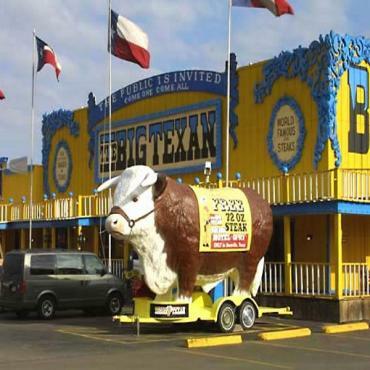 In Amarillo you'll enjoying strolling around the antique shops and Wild-West themed clothing stores. Drop into the Golden Light Cafe for a cold beer with cowgirls and boys of Amarillo. Rise early and consider a slight Route 66 detour to Palo Duro Canyon State Park, only 25 miles from Amarillo, this park boasts some of the some the most dramatic canyon scenery in Texas. Then it's on to the quirky Cadillac Ranch - an art installation made up of old Cadillacs. This is a Route 66 must-stop. Buy a can of spray paint and leave your mark on one of the cars. It's okay, it's encouraged. Stop for lunch at Route 66's half-way point the Midpoint Cafe in Adrian. As you cross the border between Texas and New Mexico, pop into the eerie Ghost Town of Glenrio, a Route 66 casualty and a great photo op. 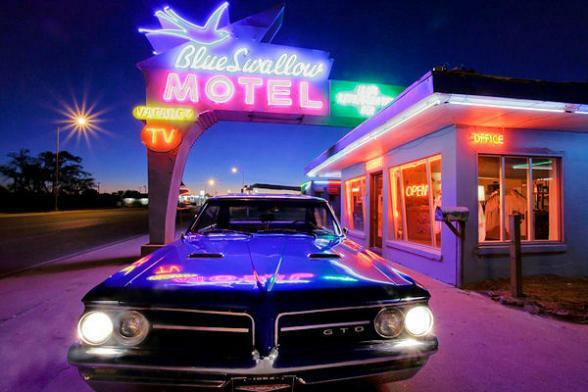 Once in Tucumcari, enjoy a taste of life in the 1950s with a slow cruise along Motel Row's historic buildings and famous neon signs. 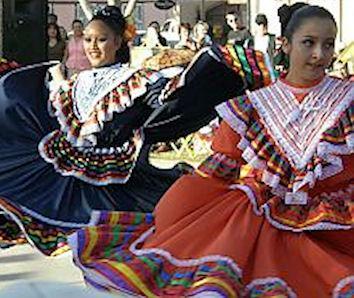 As you continue through New Mexico, known fondly as the 'Land of Enchantment', colourful Santa Fe is next. Santa Fe is the second oldest continually inhabited city in the USA dating back to 1607. It's a magical place with a vibrant feel. Park up the car and explore on foot. 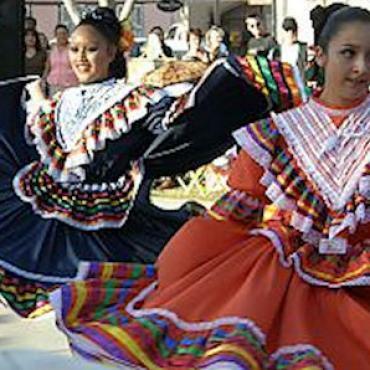 Delve into the art galleries, visit the museums and historic sites, join a walking tour or stroll around Santa Fe Plaza. Santa Fe sits at an elevation of just over 7,000ft, so on your drive today to Albuquerque you'll view sandstone mesas looming in the foreground and high pine forest peaks rising in the distance. 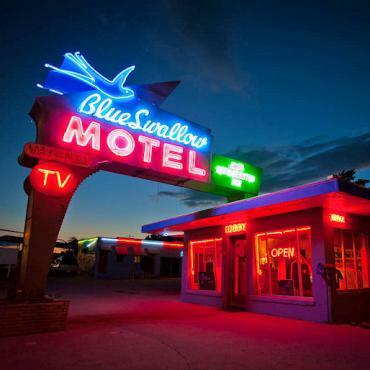 Just north of Albuquerque is historic Bernalillo, pop into Silva's Saloon for a chilled beer or the eclectic Range Cafe for amazing Mexican food. Fill up your tank and keep heading west to Gallup, the commercial hub of the nearby Navajo reservation and the self-proclaimed Capital of Indian Country, where Route 66 still serves as Main Street. It’s lined with neon signs, of course, as well as the largest concentration of trading posts and galleries selling Native American crafts in the state. 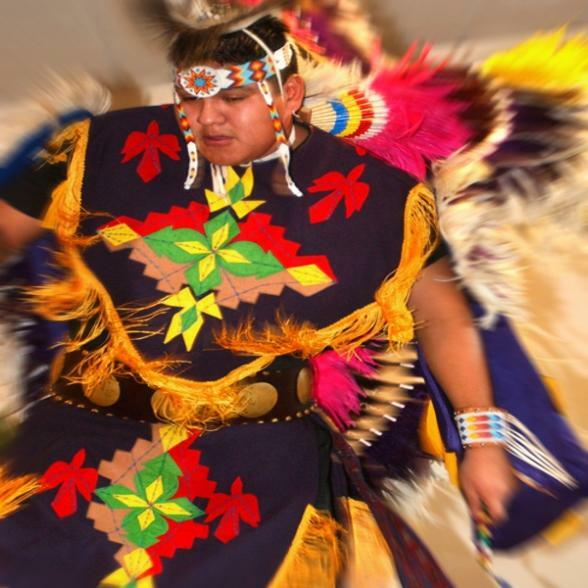 May through September you can enjoy free nightly Native American dance displays in the downtown area. 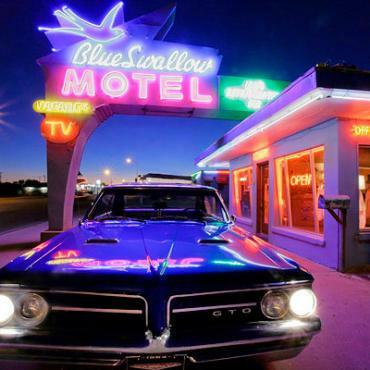 Just when you think your Route 66 road trip can't get any better, it does. 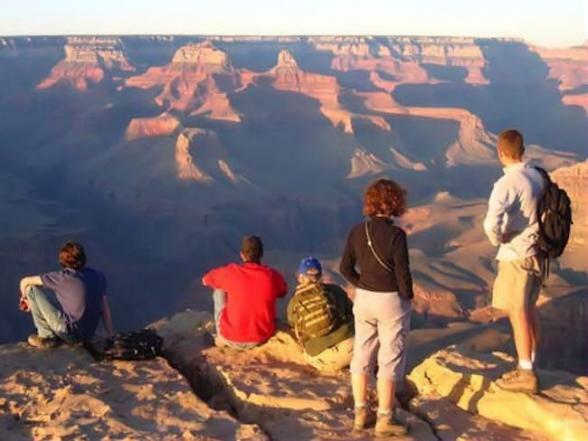 Today you'll cross into Arizona, The Grand Canyon State. Roll down the windows and let the warm desert air in. Take it slowly there's so much to see. En route to your two night stay in Williams, you'll cruise through the Painted Desert, pass the Petrified Forest and spy the Wigwam Village in Holbrook. A Route 66 must-do which is often overlooked in this area is the amazing Meteor Crater just west of Winslow. The meteorite was believed to be 50 meters and over 200,000 tons when it came crashing to the earth over 50,000 years ago. Today, Meteor Crater is nearly a mile across and sight to behold. 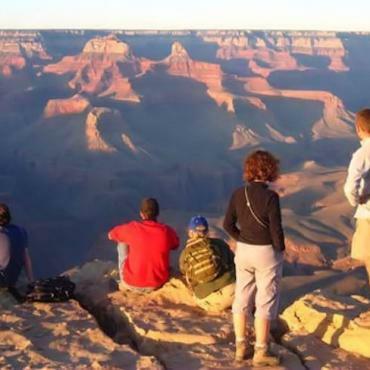 From your base in Williams choose to drive to the Grand Canyon (which should take around 90 minutes) or jump on the historic Williams to Grand Canyon Railroad. Bon Voyage would be pleased to pre-book this for you as well as helicopter trips over this Wonder of the World. Viva Las Vegas! 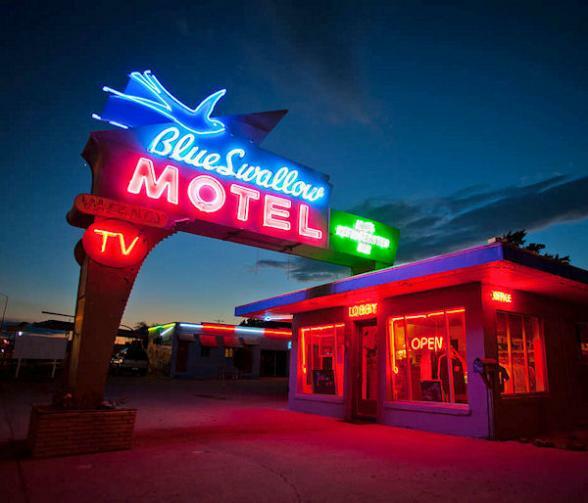 Before you arrive in Sin City take time to explore the delightful Route 66 town of Seligman, home of the Roadkill Cafe and the quirky Snow-drop Inn. Journey further west and you'll encounter Kingman, the historic heart of Route 66. The Route 66 Museum here is one of the best and the historic downtown district boasts over 40 buildings on the National Registry of Historic Places. Arrive into Las Vegas via Lake Mead and the impressive Hoover Dam. 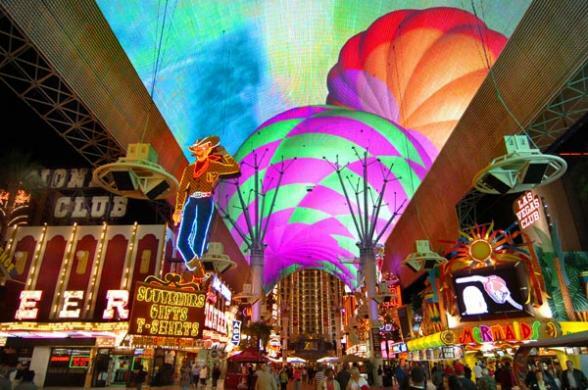 The Las Vegas Strip comes alive at night, so do cruise slowly along the strip enjoying this neon city in its full glory. 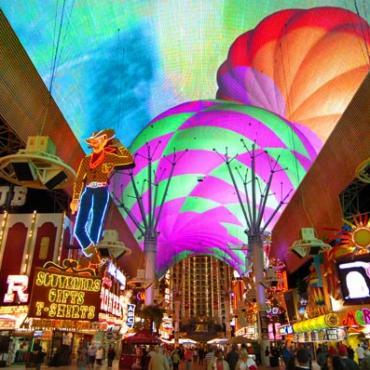 On your free day in Las Vegas, Bon Voyage would be delighted to suggest scenic drives for you in the immediate area. Alternatively, pull up a sun lounger and relax by the pool with a cocktail. Sadly, it's the final leg of our Route 66 adventure. En route to Santa Monica, you'll pass through the Mojave Desert, over mountains and through lush inland valleys before you arrive at the sparkling Pacific Ocean and the golden beaches of Santa Monica. Don't forget to have your picture taken under the 'End of the Trail' sign on Santa Monica Pier. 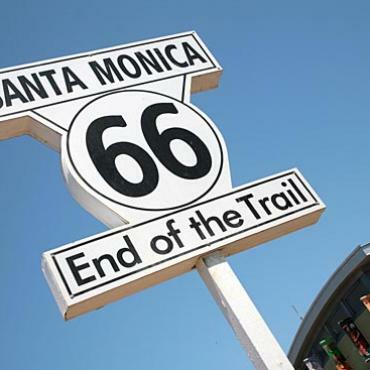 Route 66 ends here but your adventure doesn't have to. You may decide to extend your stay and head up to San Francisco for a few days or maybe fly over to the Hawaiian Islands for some relaxation before heading back to the UK. Want to extend your time in Santa Monica? Perhaps, fly onto the Islands of Hawaii? Maybe, you'd like to visit Everybody's Favourite City - San Francisco? 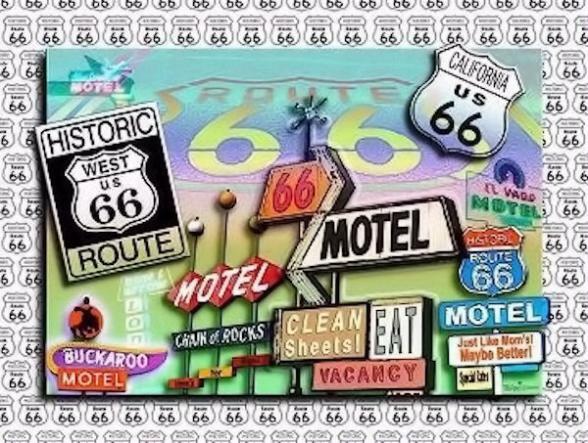 If you're considering a Route 66 holiday, you may find one of our limited edition Route 66 maps handy, don't delay contact us today! We'll also sign you up to receive ideas and inspiration on the USA.